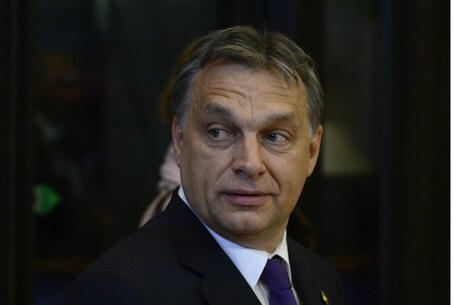 MainAll NewsJewish WorldHungarian PM Vows to Protect Jews- Insufficiently? Hungarian PM Vows to Protect Jews- Insufficiently? Hungarian Prime Minister vowed to defend country's Jews from anti-Semitism after a far-right MP made anti-Jewish remarks in parliament. Hungarian Prime Minister Viktor Orban on Monday vowed to defend the country's Jews from anti-Semitism after a far-right MP made anti-Jewish and anti-Israeli remarks in parliament. According to AFP, Orban said Gyongyosi's remarks were "unworthy of Hungary" but stopped short of directly condemning Jobbik, Hungary's third largest party, which has been widely accused of espousing neo-Nazi and overtly anti-Semitic views. "We Hungarians will protect our Jewish compatriots" Orban said. Jobbik deputy, Elod Novak, added fuel to the fire by publicly calling for the resignation of a fellow MP who claimed to have Israeli citizenship. Meanwhile, thousands rallied at a “Mass Protest against Nazism” in Budapest on Sunday against the unabashed display of anti-Semitism in the country’s parliament, urging lawmakers, as well as the public, to heed the lessons of history and root out hatred and racism. Speaking at the demonstration, Attila Mesterhazy, leader of the largest opposition party, the Socialists, called on Fidesz to help "quarantine" Jobbik and on Orban to directly condemn Jobbik in parliament. The opposition has often accused Orban's Fidesz party of appealing to Jobbik's voter base with populist and nationalistic policies. "Once and for all, Viktor Orban should with his own voice, decisively, categorically and clearly distance himself from and condemn Jobbik," Mesterhazy said.